Passes and fortresses made up the backbone of The Great Wall’s strategic importance, and you’re sure to see many of them while on your Great Wall tour. Read about the vital importance they played in The Great Wall’s defense. Passes along The Great Wall were the most important strongholds for stationing troops, and were built in the places of strategic importance, hence the saying of “a man on guard is more than ten thousand men”. Passes were generally built on lofty and precipitous peaks where mountain mouths could be easily blocked. Some passes were built in deep valleys and clutched the strategic gorge. Only by setting passes in strategic places could the defender successfully fight against the enemy of larger quantity. Most passes of The Great Wall had a pass city. Passes and pass cities of relative large scale were the backbone strategic strongholds in The Great Wall defense system. When The Great Wall was partially broken through, passes stubbornly kept by the defender would still bluff off the enemy. The passes and pass cities of the Ming Great Wall were mature in design, construction and defense functions. 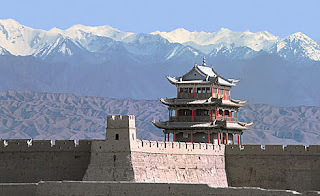 Thousands of passes and fortresses were built along the Ming Great Wall of more than 7,000 km, such as Fushunguan, Shanhaiguan, Gubeikou, Huang’aiguan, Shangjiguan, and Jiayuguan. For strengthening the Capital’s defense, the famous “three inner passes” and “three outer passes” were built along The Great Wall inside and outside the capital city and its environs. The three inner passes are Juyongguan, Zijingguan and Daomaguan. The three outer passes are Pianguan, Ningwuguan and Yanmenguan. Pass cities of The Great Wall passes are mainly composed of square and polygon ramparts and city gates, city towers, city platforms and urn cities, Relative big pass cities in the plain still had moats and net cities (circular walls) around them. Around the extremely important passes there would be accessory fortresses serving for a peripheral battlefield. The size of a pass city was decided by concrete situations. Most of the pass cities could hold a large number of troops, sufficient weapons, food provisions and military resources. Therefore, the pass cities could directly support defensive combats within their controlling area along The Great Wall. Ramparts: Ramparts of pass cities are strong. Ramparts inside and outside the pass cities in northeast China and northern China were generally built with grey bricks or slabs outside and rammed loess inside. The high and strong rampart not only could effectively hold back the enemy’s attack, but also could scare them off. On the rampart of the pass city there were built cavalry way and ladder access for cavalry and infantry. City gates: City gates were a passage for passing in an out of a pass. During peacetime they could be accessible according to administrative provisions. During wartime, they would become an exit for fighting back. In the early stage, city gates were mainly made of a wooden lintel. After the Yuan Dynasty they were made of bricks or block stones, called quanmen (arched doors). Above the gates opening there was generally inlaid a stone board, on which the title of the pass city of pass gates was carved out. The massive wooden gates were covered with sheet iron and beset with huge nails. On the back latches and lock rings were installed. City towers: City towers consist of a city gate tower and angle turrets on the rampart. The majestic city tower was a military observing and command center, and a stronghold in battle. Most of the city gate towers are of wooden structure or brick-timber construction with two or three floors. The overhanging gable roof and gable and hip roof were mainly used to meet the need of the combat and aesthetic taste. Water passes: When traversing brooks and river valleys, The Great Wall could not block off the current, and neither could it weaken the defense. Therefore, water passes of various structures emerged. Small water passes are culverts under the rampart. Big ones are much complicated. The Jiumenkou Great Wall, for example, has the Jiumen City bBridge over the Jiujiang River. Urn cities: The urn city is a small town outside the city gate. Its wall is as high as the rampart. Its shape is circle or square, with square in the majority. There is a saying of “to catch a turtle in an urn” and the town is like an urn, hence the name. The urn city played a role of extending the defense in depth and strengthening the defensive capability. The urn city Is generally in plumb with the chief city gate. In this way, even if the enemy had entered the urn city gate, they could not successively attack the chief city gate. At the same time, defenders on the ramparts in the four sides could effectively shoot the enemy downward. Net cities: The net city is a long closed circular city wall for protecting the urn city and the chief city rampart that were exposed to the enemy. Outside the First Pass In The World in Shanhaiguan there was built the Eastern Net City that served for the first defensive line in Shanhaiguan. Moats: The moat is a trench barrier dug out around the chief city, and was irrigated by a river. The moat had been generally designed before the real construction of the rampart. The earth dug out would be directly used to build the rampart. When the rampart was completed, the moat also took shape. There is a moat of about 6 meters deep and 15 meters wide around Shanhaiguan. The enemy had to wade the moat before they reached the rampart. Therefore, it would enable the defender to improve the defensive capability and the enemy would find it harder to launch an attack.